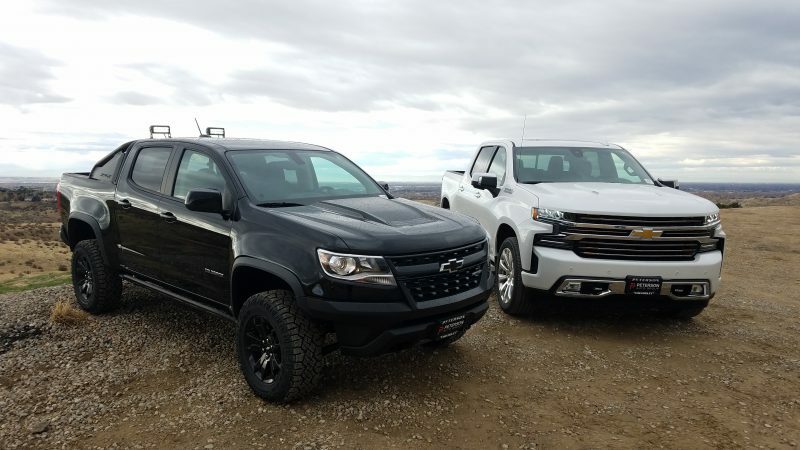 We recently took the all-new 2019 Silverado and Colorado ZR2 up 8th street in beautiful Boise, Idaho for a test drive. The pavement quickly turns to dirt where the washboard road immediately tests both suspensions. The buttery ride allows you to focus on other things like which side roads you are going to take to test the off-road capability of these iconic brands. The Colorado ZR2 is outfitted with a Multimatic suspension, front and rear lockers, 31″ Goodyear tires as well as a downhill, assist to name a few. It’s touted as an “off the shelf rock crawler” and it does not disappoint! We also took out the all-new 2019 Silverado High Country and talk about rugged luxury! All the creature comforts you can imagine like wireless charging, heated and ventilated seats, 4G LTE WiFi, a unique camera that gives drivers a view of what’s behind the truck through a digital image in the rearview mirror, and so much more. It’s wider, taller and more aerodynamic than ever before. Whether playing in the hills or heading to downtown Boise, the 2019 Chevy Silverado and Colorado ZR2 are built for it all.